Our specificity is the development of cleanroom processes from single step to advanced multiple mask levels; this allows us to explore highly original designs, thus novel MEMS concepts that are not limited by a fabless approach. We use top-down approaches based on silicon, b-SOI or unibond-SOI, III-N epitaxial wafers, and polymers. We are able to conduct process integration at the best level using e-beam and optical lithography specifically developed for MEMS/NEMS, several etching techniques (ICP-RIE, DRIE, wet etching) as well as oxides, nitrides and other deposited materials. Recently, we have undertaken basic research into flexible electronics fabrication technologies using a top-down lithographic approach. There is currently no dominant lithographic planar approach – as there is when using a rigid substrate – and nam6 wishes to be at the forefront of these developments. We demonstated that a functional material could be achieved by mixing the photoresist SU-8 and the elastomer PDMS to form a photo-hardenable material for strain shielding (Fig. 1). We evidenced size related effects concerning fundamental cracking in nanometer think metallic films (Fig. 1b) which can be modeled to predict experimental data (Fig. 1c). 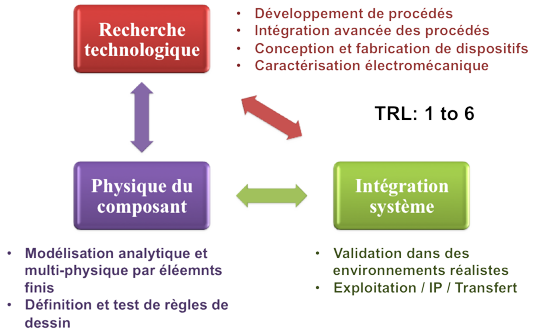 Figure 1: Novel processes for microsystems and flexible electronics. 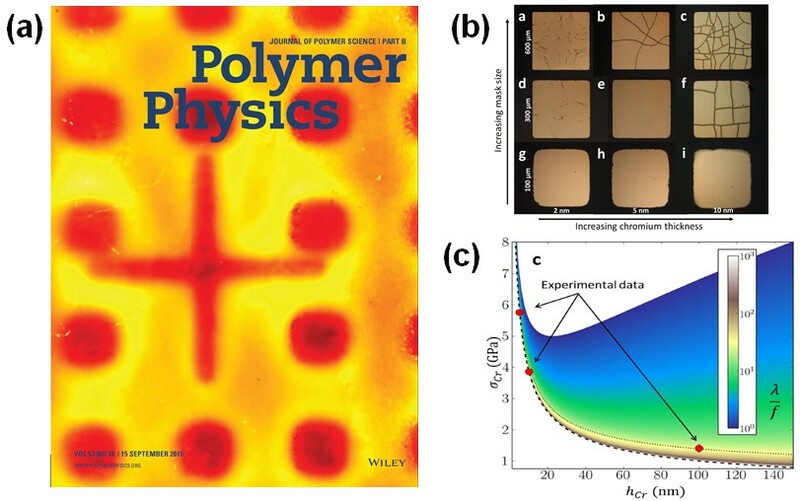 (a) Front cover of J. Polymer Physics showing a novel photo-hardenable SU-8/PDMS mixture—the red parts are mechanically stiffer than the yellow parts. (b) Evidence that cracking is a size effect in thin metal films on flexible material—thin small metallic features do not crack. (c) Modelling and experimental points of surface stress versus metal thickness. Collaborations: Yvon Cordier, Fabric Semond, CNRS-CRHEA. B. Dulmet, J. Imbaud FEMTO ST. The group has pioneered the GaN MEMS field since 2008. We still improve the R-HEMT concept that was proposed in 2009 in GaN MEMS, applying it recently to a first inertial sensor. We are working on ultrathin epilayers (Fig. 2), and more recently NEMS transducers, both to increase the force sensitivity and make III-N based sensors compatible with specific harsh environments. 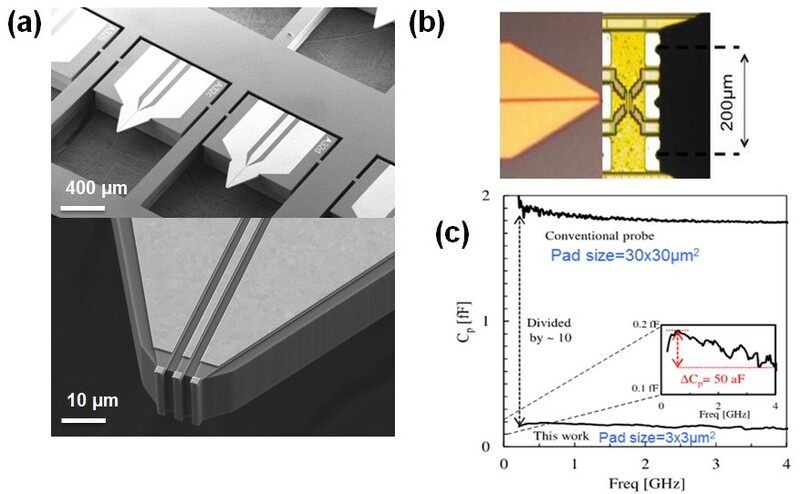 a) GaN doubly clamped beam microresonator made on 700 nm epilayers, preparing the NEMS needs for harsh environments compatible force sensors. is a continuing topic. 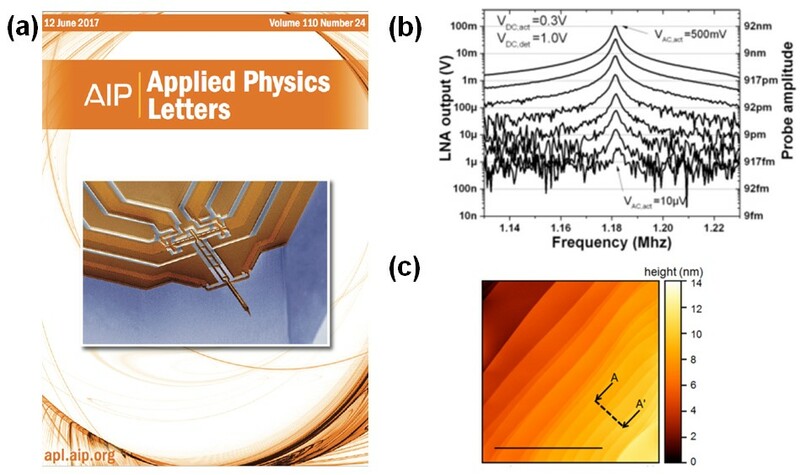 Over the period of the report we have matured MEMS ring-probe resonators for high frequency Atomic Force Microscopy. This technology has been pushed above TRL4, disseminated in small volumes to other partners and transferred to Vmicro company. Successful demonstration activities (Fig 3) position this probe as the highest frequency operated AFM in real conditions. 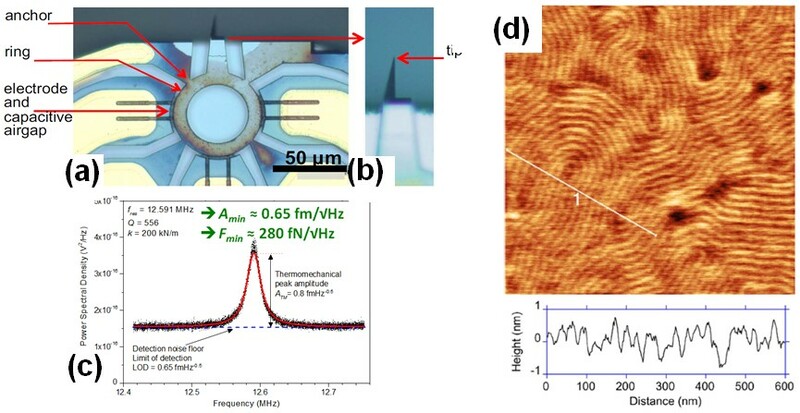 (a) ring-probe developed at TRL>4 by NAM6 group, featuring a 12 MHz resonant tip engineered using bulk vibration mode. (b) integrated silicon tip batch fabricated with a 10nm apex. (c) using an RF reflectometer technique based on a 4GHz carrier, we demonstrated an AFM head able to reach a 0.65 fm/Hz1/2 amplitude noise floor. the thermal peak is recorded and the minimum detectable force is 280 fN/Hz1/2 . As a joint work with Vmicro, the Vprobe technology was released in 2017. This silicon vertical probe (Fig. 4) is based on a totally different design strategy. It intends to unlock the AFM instrumentation in vacuum, were the performances in any modes (FM, AM, electrical, optical) are limited by the quartz approach. NAM6 is also working on or RF measurements. We address demands made to us by near-field NSOM/Raman community that lacks of a reliable dedicated probe. For example we are nw developing a cantilever technology with integration of metal nano-cones to control and enhance the Raman effect. 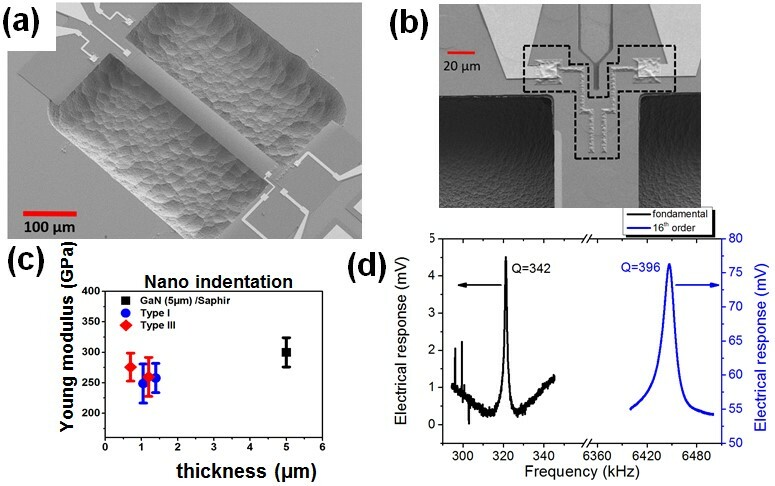 To provide a solution to growing demands in high frequency, on wafer probing of RF-CMOS technologies (Keysight, STmicroelectronics) a miniaturized microfabricated ground-signal-ground (GSG) have been developed in NAM6 during the period of the report (supported by PIA equipex excelsior). Figure 5a shows an example of such probes destined for on-chip microwave measurements in a dedicated scanning electron microscopy/microwave measurement setup (not shown here). The probes tips are much smaller than commercial tips—by a factor of >100—enabling direct on-chip testing of isolated devices and objects—see Figure 5b. Measurements indicate a drastic reduction in parasitic capacitance compared to commercial probes—see Figure 5c. Figure 5: Microfabricated MEMS-based ground-signal-ground (GSG) probes for on-chip microwave measurements. (a) upper–chips based on silicon-on-insulator wafers comprising a metallized micro-cantilever,;lower—image zoom of the tip of the probes – incorporating gold contacts (~2×2µm) and coplanar lines. (b) MEMS probe alongside a commercial µwave probe. (c) evidence of reduced paracitic capacitance when using MEMS probes. Collaborations: Groupe ANODE (G. Dambrine, K. Haddadi), Groupe NCM (N. Clément, F. Alibart, D. Vuillaume). in parallel to our sensors and technological topics, we pursue activities related to instrumentation ’beyond the current limits’. We develop RF techniques based on interferometry to increase measurement sensitivity and resolution at high impedance (MΩ range) and, as an application, provide the readout of capacitive MEMS with high signal to noise ratio, which has been applied to ring-probe resonators. We also apply these techniques to Scanning Microwave Microscopy at 2-18 GHz (and higher in the future), which makes us able to measure RF properties of nanoscale surfaces and devices. This has been applied for instance to 17 GHz measurements of sets of molecules grafted on Au nanodots: see Figure 6. (a) setup coupling a VNA, a home-made microwave interferometer, an AFM and a resiscope. (b) 2D |S11| histogram (normalized to 1) versus tip bias (V) generated from images of 100 molecular rectifier junctions. The rectifying behavior is clearly observed. (the voltage step is 50 mV and meas. frequency is 17 GHz). (c) Conductance estimated from both d.c. measurement (dI/dV) —red curve—, and S11 parameters —blue curve—. The error bar in log scale is considered to be the same as the full width at half maximum in current histograms. Microwave optomechanics (w-optomechanics), in which mechanical motion can be manipulated and detected through microwave photons, is a highly interdisciplinary research topic. It is at inter section of mesoscopic condensed matter physics, microwave engineering, circuits quantum electrodynamics and nanotechnology. Here, we focus on develop novel 2D and 3D mw-optomechanical platform for wiede range of the temperature, from room temperature to ultra-low temperature. 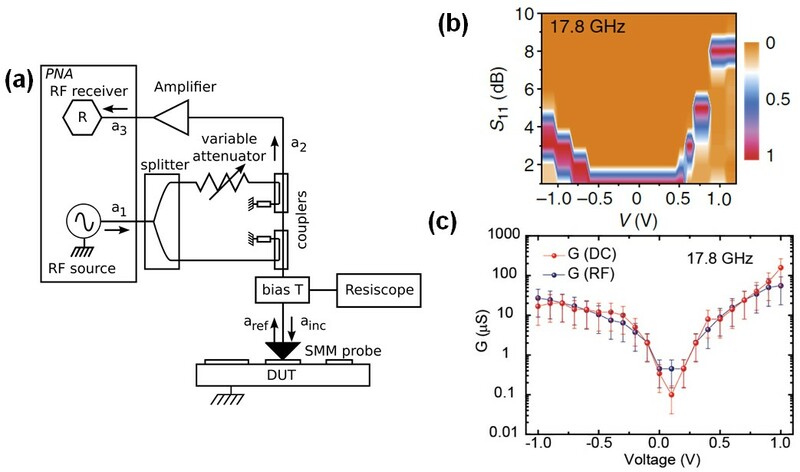 Based on this platform, we explore several functional devices for both fundamental research and applications, such as quantum limited non-destructive phonon detectors, single phonon-phonon coupling platform and w-optomechanical signal processing for classical analog of quantum computation. Figure a: Multiplexing readout for microwave optomechanical circuits. Each microwave resonator capacitively couples with nanomechanical resonators with structure of Si3N4 suspended beam. Figure b: 3D microwave optomechanical design. The chip contains a hybrid structure: antennas and mechanical oscillators to form a wireless optomechanical scheme.